Bilden av Budde. Studier kring en svensk språkpionjär, utg. av Lars Wollin. (The Image of Budde. Studies of a pioneer in the Swedish language.) Uppsala 2011. Samlingar utgivna av Svenska fornskriftsällskapet. Serie 1. Svenska skrifter 95. Uppsala. 121 pp. ISBN 978-91-976118-6-2. The first professional translator of the Swedish-speaking area was the fifteenth-century Finland- Swedish monk Jöns Budde, considered to have been the first prolific man of letters in Finland. Budde stands out beyond comparison as the most prominent follower of the Bridgetine tradition that originated from the Monastery of Vadstena, Sweden, and its Finnish branch in Nådendal. These institutions left their distinctive mark on late Medieval development in several areas of culture, with influences that resonated into modern times. The contributions to this volume are based on scolarly papers presented at the symposium Jöns Budde – lingusitic pioneer and leading figure of his time (Jöns Budde – språkpionjär och samtidsaktör), arranged in Turku/Åbo on April 4-5, 2008 by the Department of Swedish at the Åbo Akademi University. The event received financial support from the Swedish Academy, the Research Institute of the Åbo Akademi University Foundation, and the Academy of Finland. The introduction to the volume (Wollin) offers a survey of previous scholarship on Jöns Budde and contextualizes the contributions in the present volume. The collected essays present findings on a range of issues: Budde’s geographical provenance, as assessed on the basis of linguistic criteria (Nikula); research questions raised from the perspective of ”new philology” in order to examine his message as well as the content and textual structure of his works (Carlquist, Lamberg); and the stylistic patterning of his writing (Tiisala). A central topic perceptible in all the contributions to the volume is that of translation history. As a skilled and industrious early translator from Latin, Budde holds a focal position in the late medieval refinement of Swedish as a language of culture in Europe. 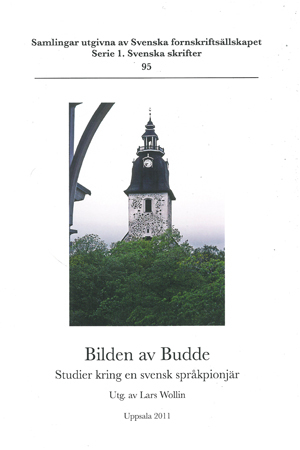 Keywords: Budde, Finland-Swedish dialects, medieval philology, monastic culture, Old Swedish, translation.